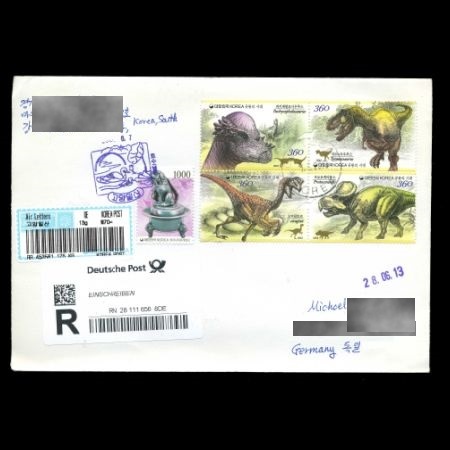 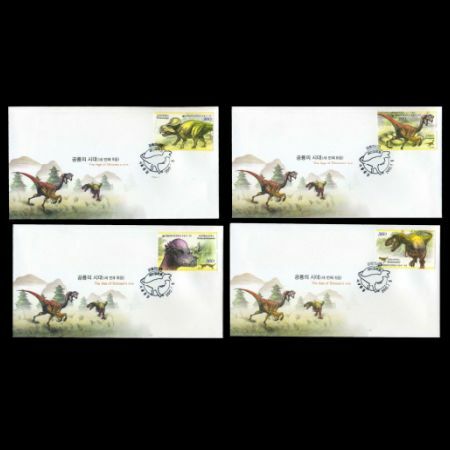 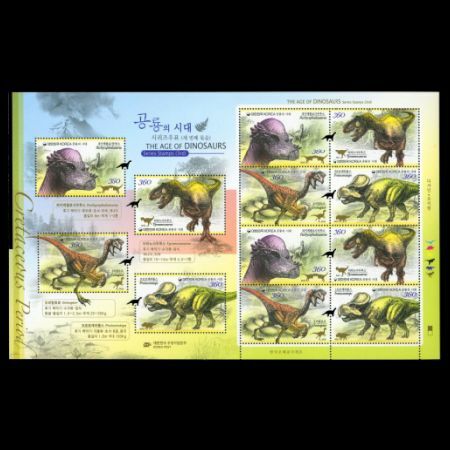 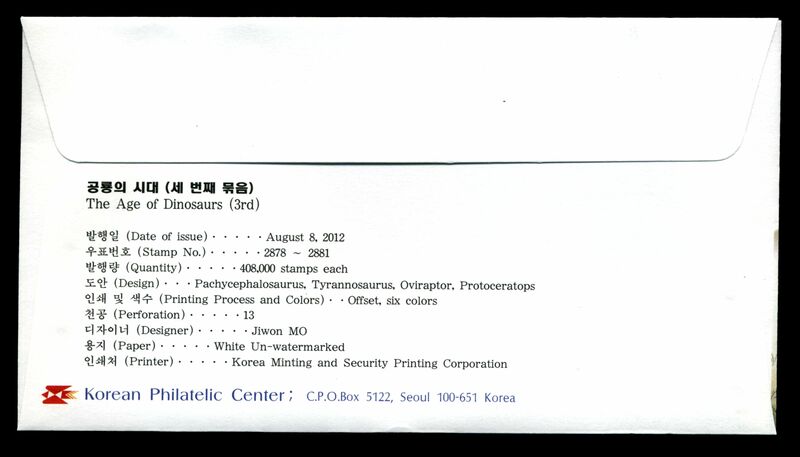 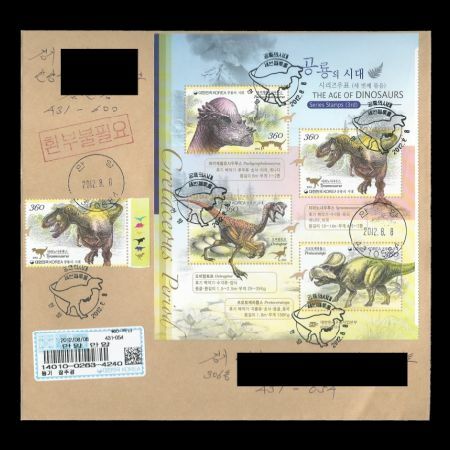 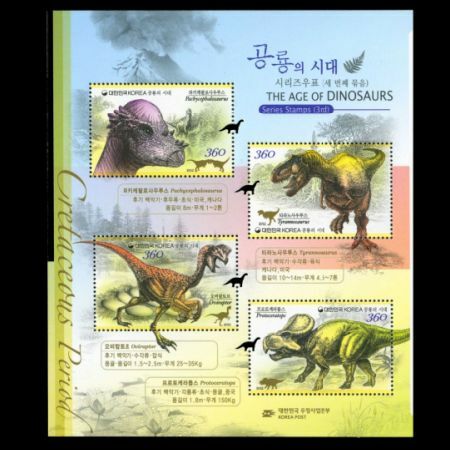 Korea South 2012 "The Age of Dinosaurs (3rd)"
As the third installment of The Age of Dinosaurs Series Stamps, Post of Korea introduces the Cretaceous dinosaurs of the Mesozoic Era. 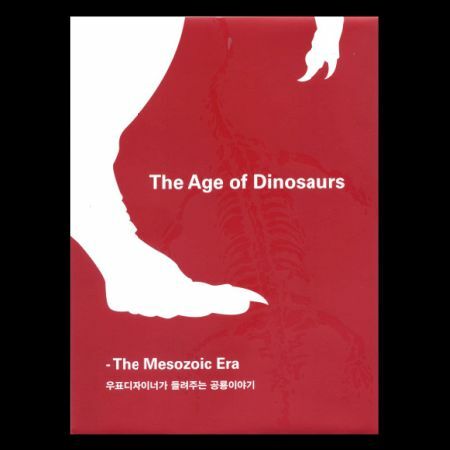 The Cretaceous Period, the last period of the Mesozoic Era, refers to about 80 million years spanning from about 145 million years ago to 65 million years ago. 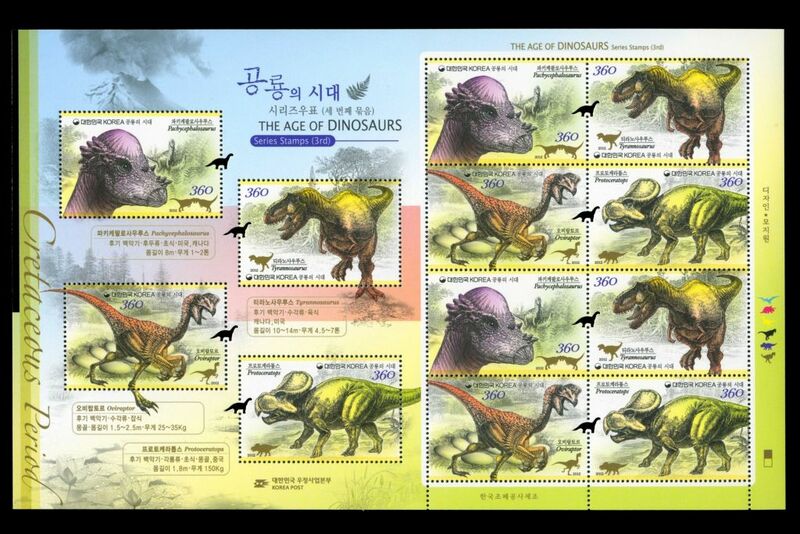 During this period, a wide diversity of animals such as ammonites, dinosaurs, and birds, prospered with angiosperms. As a carnivorous dinosaur of the late Cretaceous period, it is one of the most frightening and fiercest dinosaurs, as indicated by its name which means tyrant lizard. 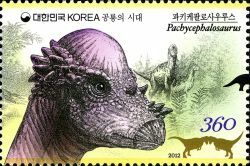 It is easily distinguished with anatomical features fit to attack and dominate other dinosaurs such as sharp, cone-shaped teeth as long as 20 cm, saw-like blades both in front and back of the teeth, big and long hind legs, and sharp claws. 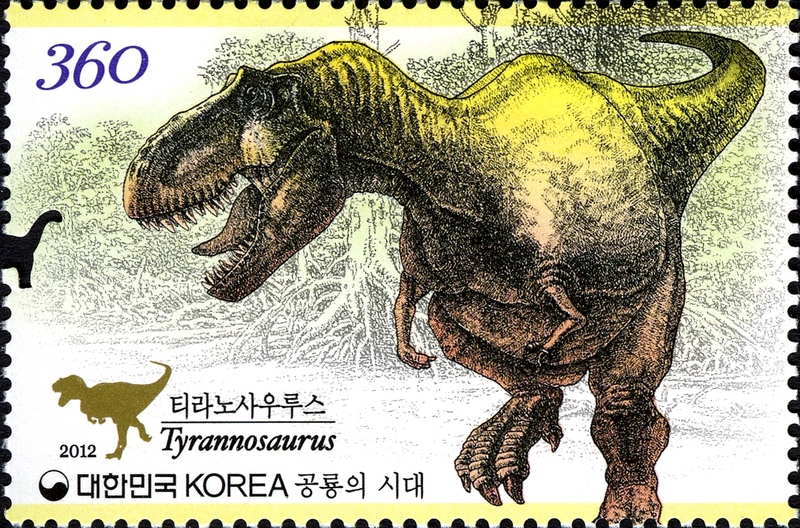 Tyrannosaurus lived in U.S. and Canada, grew up to 10~14 m long and weighted 4.5~7 tons. As an herbivore of the late Cretaceous Period, Protoceratops is characterized by a large skull with a frill comparable to its body size. Its body was bulky like a large pig, showing a primitive form. 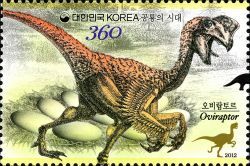 It also had a beak much like that of a parrot. 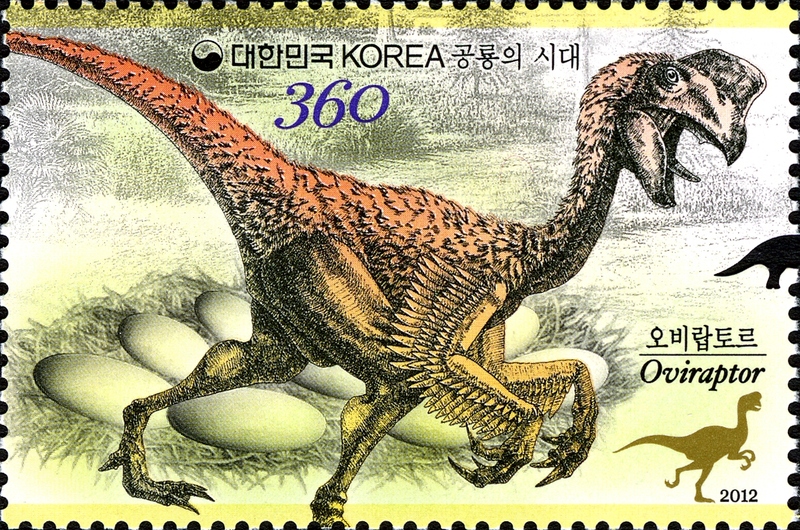 Equipped with a strong and hard beak with sharp teeth, it is assumed to have been able to masticate plants very well. 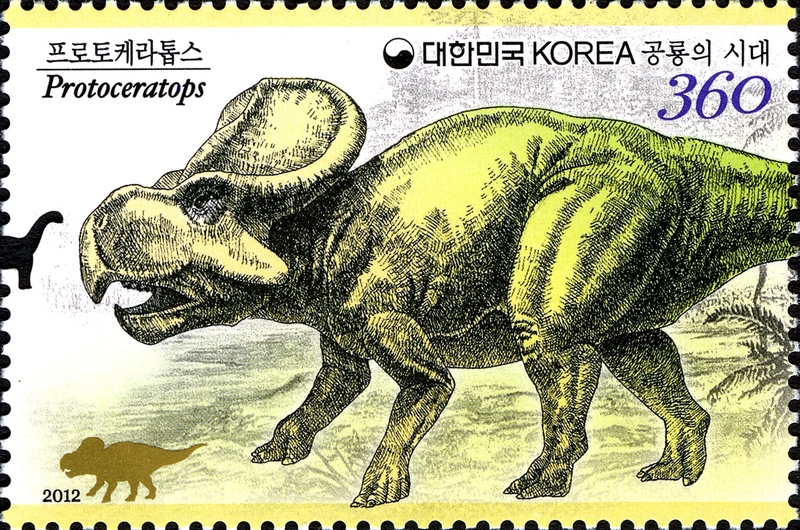 Protoceratops lived in Mongolia and China, was 1.8 m long and weighted 150 kg.